Moving ECA Mass to become more of a networked and networking organization was one of the primary themes of our strategic planning work throughout the winter. The opportunity of this approach for our organization and for each of us as individuals is broad and very exciting. This article maps out the scope of the networking possibilities for ECA Mass and suggests some methods that can help us bring attention, engagement, and collaboration to our work. I’m part of a research team mapping out the contours of the enormous system of interrelated national and international not-for-profit organizations working in some way at the intersection of security and sustainability. Sustainability issues – with global warming and climate change in the lead — drive all sorts of security issues, e.g., conflicts over how to address droughts or sea level rise. We have already identified about 2,500 of these internationally and nationally focused organizations and project that there are at least double that. And new ones are showing up every day. Elders Climate Action is one such organization. Counting businesses, government entities and local organizations committed to sustainability and security, the number would likely be in the many tens of thousands. This represents a tremendous opportunity to harness the power of networking. Whatever we are trying to do, we are not alone. For example, if you wanted to be part of the effort to fight fracking, connecting with Food and Water Watch would be an excellent place to start looking for information and collaborators. Its website has over 1,000 references to activities and people active in Massachusetts. Despite all this activity and commitment, we are far short of having the power to force the clean energy transition in time to stabilize the climate. As Grady McGonagill says, “We are winning, but too slowly.” The pro-climate movement, despite its thousands of organizations and millions of adherents, needs much more traction and public support in order to win significant public policy changes toward rapid decarbonization. Collaboration –develop partnerships with allied organizations to magnify impact. 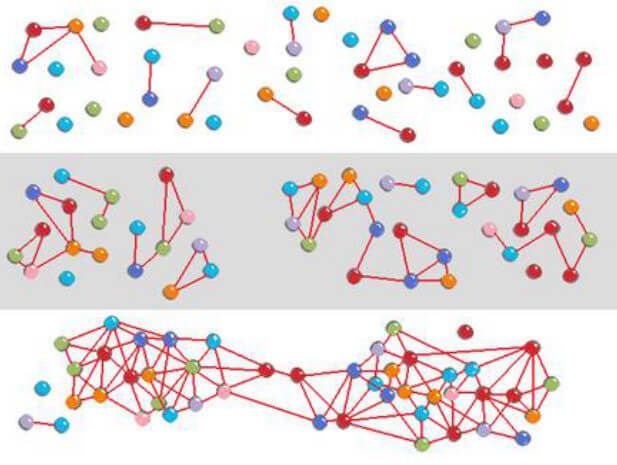 To succeed our movement needs what the social scientist, June Holley, calls Network Weavers. June is another one of the terrific cadre of strategists, scientists, activists and politicians ECA Massachusetts and National have been adding to our own network. We anticipate working more closely with June and other network analysts as the year unfolds. Network Weaving is a very exciting and energizing activity. Being an agent in the creation of a network or participating in the strengthening of networks brings us in contact with dynamic people committed to the common mission of understanding climate change and mitigating its impacts. If you’re already a networker, bringing those skills to bear in support of ECA’s mission will expand your repertoire of abilities and your personal connections in a fulfilling way. If you haven’t worked on the creating and participating in networks in an intentional fashion, doing so will take you to a learning edge full of personal development possibilities. Being a network weaver takes concentrated work, creative thinking, a willingness to work with a diverse set of people and a frank assessment of one’s strengths and weaknesses. June suggests some serious self-reflection as a precursor to taking on the challenge of network weaving. An important first step is looking at your personal and professional networks that could support your ECA-related projects. The essence of the approach is to think expansively and intentionally about the network of people you know (or could know) that will help you advance some climate activism project you care about. A number of us engaged in a version of this exercise in the January chapter meeting. How much do you like connecting with a wide range of people? How good are you at generating projects and coordinating and coaching others as they work on these projects? Are you good at facilitating the work of others with one another and with your own vision? How do you rate yourself in terms of your willingness to support others in their networking activities, e.g., in the use of social networks? ECA Mass values a set of skills often present in vintage human beings who have developed judgment and perspective over the course of their life experience. Key skills are the capacity to listen thoughtfully to others, a willingness to commit to considered action, and loyalty to friends, family and colleagues. These are all important to effective network weaving. The more intentional we become about our individual and collective networking, the greater the contribution we’ll make toward the achievement of our vision for a brighter and healthier future. We’ll be developing this focus through trainings and group activities, starting with our June chapter meeting.